Further it is known that each of these eight persons works with a different company among A, B, C, D, E, F, G and H in any order. 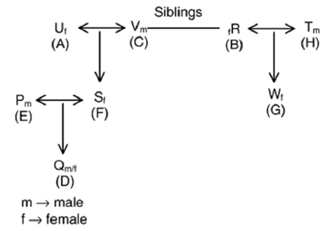 V and Ft are the only siblings in the family and U, W, R and S are of the same gender. W and V do not form a married couple. The person who works with A is the mother of the person who works with F, who, in turn, is a female. V, does not work with E, and his daughter is S. R works with B. The person who works with G and the one who works with E belong to the same generation. The person who works with G is a female, whereas the person who works with E is a male. The person who works with C is the maternal grandfather of Q, who, in turn, works with D. T works with H.
Q1. Which company does W work with? Q2. Who among the following is the spouse of the person working with E? The person works with E is unmarried. Q3. Which of the following pairs of persons form a married couple? Q4. Which of the following statements is/are definitely true? W is the daughter of P.
(1) Those 8 members of the family belong to three different generations. (2) There are three married couples and two persons are unmarried in the family. (3) Each married couple has at least a child. From the above three conditions, we get the following two possibilities. 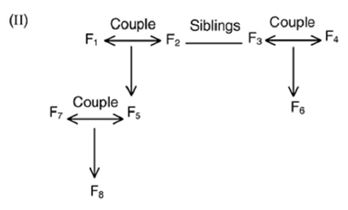 Here, the family members are denoted by F1, F2,…., F8. It is given that V and R are the only siblings. 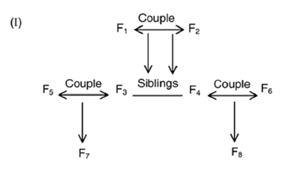 Thus, let us consider F3 as V and F4 as R.
V has a daughter 8, thus F7 is S.
Therefore, U, W, R and S are females. The person who works with C is the maternal grandfather of Q. Therefore, F8 is Q, who works with D. Let F1 works with C.
It is given that R works with B. The person who works with A is the mother of the person, who works with F and both are females. The only possibility is that F5 (wife of V) works with A and her daughter works with F.
Since, the person working with G and E belong to the same generation, V works with E, which violates a condition. Therefore, this case is not possible. In this case, F3 is V and F, is the person who works with C.
F6 is S and F8 is Q.
F4 is U, who works with A and thus F6 works with 8. Therefore, F7 and F5 will be working in E and G respectively. => V will be working with H, which is not possible. F3 is R and V works with C.
F5 is S and F8 is Q and works with D.
W is not the couple of V.
Since, W is a female, she can’t be F4 or F7 (as both are males). => F1 is U and works with A and thus S works with F.
As the persons working with G and E belong to the same generation, the only possibility is that W works with G and F7 works with E.
=> F4 works with H.
Therefore, F4 is T and F7 is P.